Pinterest inspired | Just Jess Fashion! RIP Saks necklace. Holding my precious fur baby this past weekend, she got scared and accidentally broke the necklace. Cupcake presentation, among the rest of the party was all Pinterest inspired. What a crazy fun weekend! Finally had an opportunity to debut my home with a housewarming party. #housewarmingpartyintheUSA! was the theme! Hence why it looked like Independence day threw up all over my home. But alas, both the party and actual 4th of July required the perfect patriotic ensemble. One of the best part’s of Summer in addition to perfect sunny weather all day ever day? Summer sales! Asos, has been my one stop shop for all my patriotic essentials and each piece was less than $40. From my star spangled romper to my red dress, I’ve been able to find the perfect digs that I can totally get away with wearing the rest of the season. Some say the world is your runway. While yes, every fashion blogger will preach that to be true, every fashion blogger treats a holiday like it’s Paris freaking Fashion week. Sparing no detail. So literally this past weekend’s wardrobe had been in the works for at least a month, making sure each print and accessory matched accordingly. Fortunately, I had tons of white accessories to compliment my red and blue choices. And what better accessories than those super cheap and over the top patriotic essentials found at a party store for a more dramatic holiday statement? So while this past weekend was one for the books, and truly thank you to all my friends and family who showed up, I can’t help but feel the pressure of my next favorite holiday. Let the countdown for Halloween begin! Becoming inspired is only half the battle though! An idea is only such until you start looking for ways to bring your inspiration to life. How I ever made it through Halloween or any festive event before Pinterest is beyond me. The makeup idea came from Pinterest (construction paper to add drama to falsies, who’d of thought?!) Nasty Gal, coincidentally just happened to be having a sale on one of their signature dresses in the perfect shade of green. And even better it was sparkly! The universe was practically begging me to be Marge! 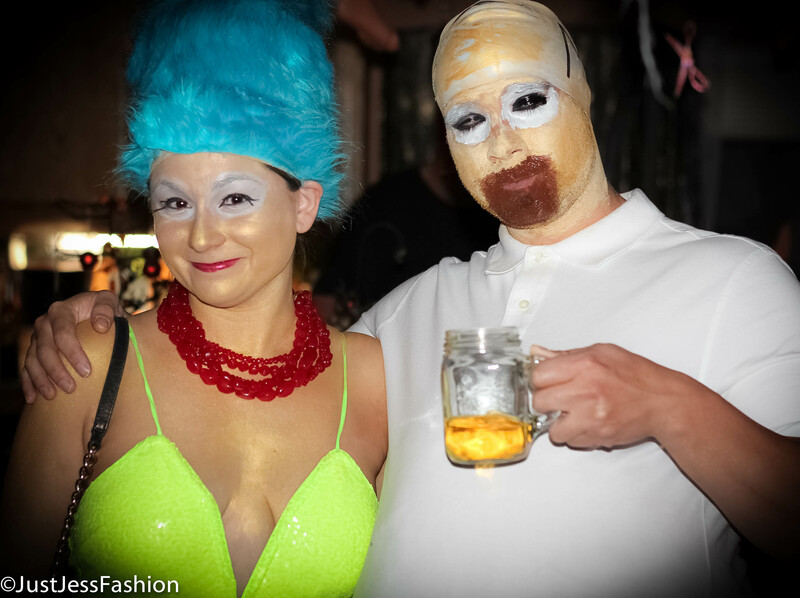 The only thing that was pure my imagination was Marge’s signature blue beehive hair do. I searched through countless wigs. I even considered going with a young Marge vibe which would mean I would have to settle for long flowy blueberry shade of blue locks. But every wig I found reminded me too much of Katy Perry, which is fine for Katy Perry things but this was serious and settling was not an option. Then I found it! 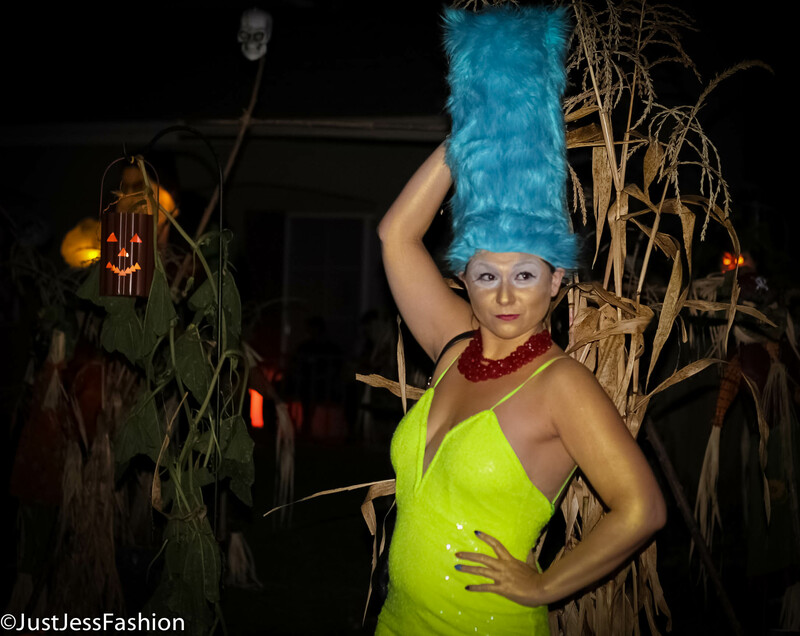 The official wig that went with the Marge Simpson costume. It wasn’t dramatic enough and not worth the $80 the costume store wanted to charge for it. Ugh, if you want something done right ya just gotta do it yourself! Right across the aisle way from the Marge costume, strategically placed were a pair of fuzzy leg warmers for a Dr. Seus inspired costume. If anyone understood the cartoony drama I was looking for it totally would be Dr. Seus! Although looking back now I probably could have just gone to Joannes and picked up some blue fuzzy fabric. Alas, I finally found what I was looking for. I took the leg warmers home and a discussion about how high was too high and some magic with some thread, a glue gun and plastic bags later my perfect Marge Simpson wig was made. I sewed the top of one of the leg warmers together. I took some fabric off of the second leg warmer and attached an elastic head band to it. Next I glued the elastic band to my enclosed leg warmer and stuffed the center with plastic shopping bags. Several things were tried to keep it up but the bags seemed to work best. If the stuffing was too heavy it caused the wig to collapse. I have never been so proud of a creation in my life! I was pretty impressed with my work until we went to a Halloween Party and someone showed up in a homemade Bat Mobile. The people in our neighborhood get how important this holiday is. From my Marge masterpiece, to the Bat Mobile, to our neighbors amazing set up I’d say we’ve got this Holiday covered! There must have been a Simpson’s memo sent out because one of the Halloween parties we attended had not one but TWO Duffman! What are the odds? 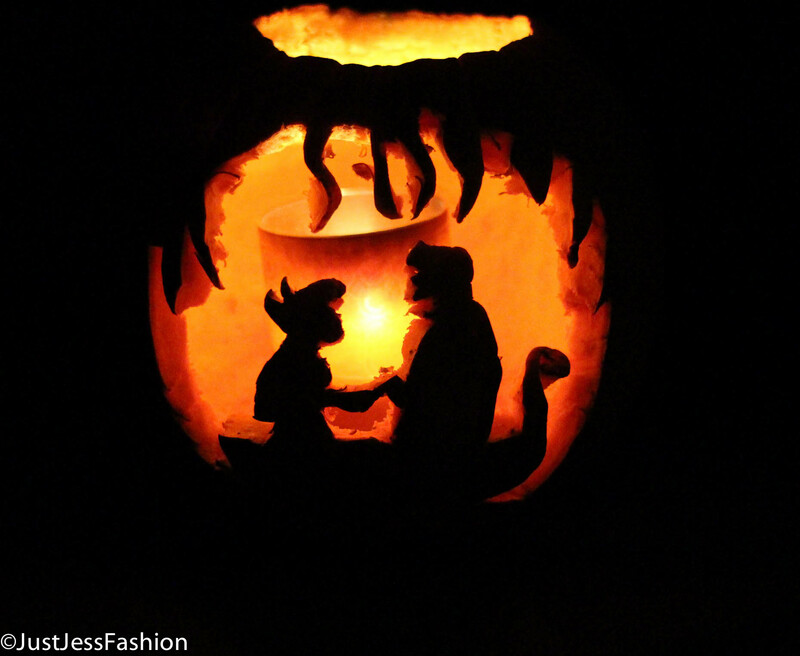 I wonder how many Little Mermaid scenes I can re-create in a pumpkin? Which scene should I do next year?! Step by step tutorial for Marge’s makeup.